One of our greatest victories is under attack. Last month, the Federal Communications Commission (FCC) used their legal regulatory power to pass rules to ensure the internet is fair, open, equal, and accessible for all. After a long fight where over four million people--maybe even you!--submitted comments to the FCC, Chairman Wheeler decided to stand on the right side of history and regulate the internet so service providers can’t decide what you can post, read, and watch online. For Asian American and Pacific Islander communities, an open internet means a fair chance to be heard and the opportunity to thrive. Now, Republican-controlled Congress is trying to do the dirty work for the big telecoms after they lost at the FCC. On March 25, a key hearing will be happening in the House Judiciary Committee. It’s important that our allies in Congress on Team Internet stand firm in support of the FCC’s Title II rules. Representative Judy Chu (D-CA) is on the Judiciary Committee and is the Chair of the Congressional Asian Pacific American Caucus, which makes her a leading voice for our communities in Congress. 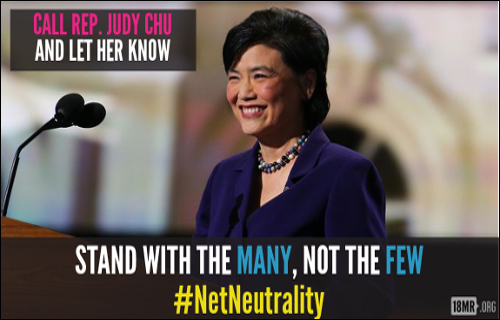 We’re calling on her to stand firm as a champion for the internet and for our communities.